When metal is produced from ores and other materials, it is often formed into sheets. These sheets are often available flat, although the sheets can also be formed into rolls. The sheets also come available in varying thicknesses from the thickest which is known as plate, to the thinnest which we generally recognise as foils. These sheets can be made from various metals, with steel and aluminium being among the most common. Sheet metal fabrication is the construction of buildings, compliance’s, vehicles and a wide range of other items from these metal sheets. Sheet metal is also used in the construction of items like engine parts and tools. The metals are often used alongside other materials such as plastics and concrete. There are numerous techniques involved with sheet metal fabrication, all of which can achieve different effects. The tools and methods being employed by steel fabricators are also likely to vary according to the metal being worked with and the thickness of the sheets. Laser cutting is an extremely precise method of cutting a design from a given material using a CAD file to guide it. This involves firing a laser which cuts by melting, burning or vaporizing your material, providing a fine level of cutting detail. Once cut to the right size and shape, the metal sheets are then manipulated into the right form. This is often done using hammers or similar. For thicker sheets, press brakes apply extreme pressure to the sheets to bend them into shape as needed. Modern sheet metal fabrication factories use CNC Folding machinery that makes sheet metal fabrication far easier and faster, helping with mass production. Steel fabricators will often create separate pieces that then need to be joined together to help make the final product. One common form of joining sheet metal together is with rivets and these rivets can often be seen on various objects, particularly in larger objects that use thick sheets. Welding is another popular method, although other techniques such as the use of adhesives and fasteners are also quite common. Unless you are out in the countryside or similar, you are likely to never be far from something that has been made through sheet metal fabrication. Cars and other vehicles tend to have parts made from sheet metal, with chassis in particular consisting largely of sheet metal. Even in the home it is fairly common, with appliances such as microwaves and sinks made in this way. It’s all been sheet metal fabricated somehow, for want of a better term! 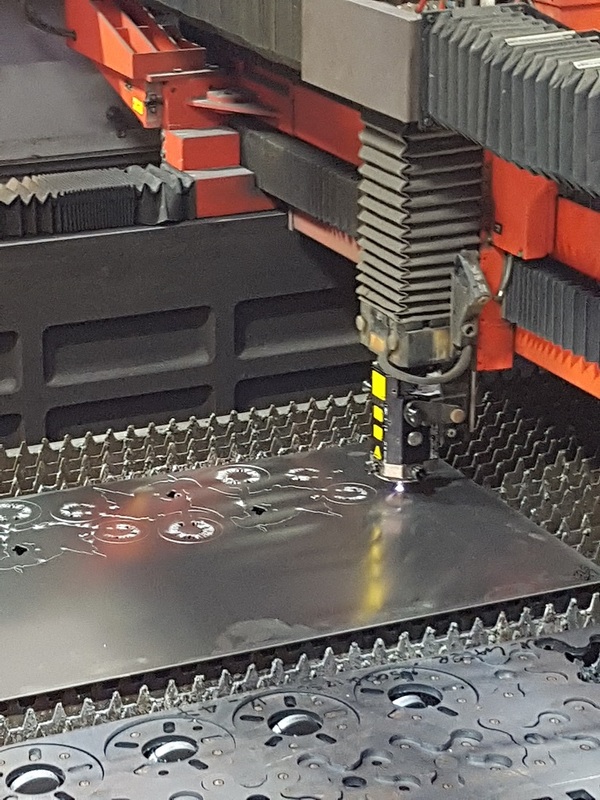 For more information on all the Sheet Metal Fabrication possibilities at Yorkshire Laser, contact us or get an instant quote today!